Shorter Schedules – Building a modular unit in a shop, with a well controlled fabrication sequence, can save months when compared to building in a plant environment where fabrication is subject to permits, work stoppages, and other construction slowdowns. Lower Cost/Lump Sum Bid – Typically a 25-30% reduction in cost can be realized with modular construction when compared to field construction. Prices quoted for modular constructed systems are firm fixed prices. Construction Proceeds While Waiting for Permits – Offsite construction of the entire modular system in our shop can proceed while permits are in process. This can be a significant time saver in the construction schedule. Once your module shows up on site, it’s a short “17 Days from Crates to Product”. 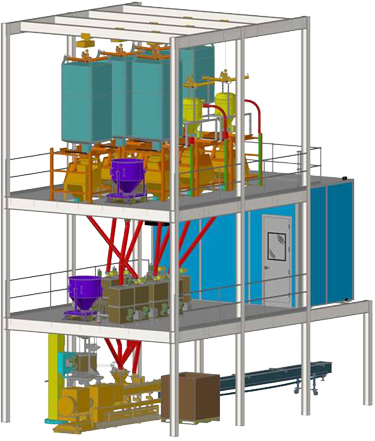 Minimal Plant Site Interruption – In the case where a new extruder line is installed in an active process facility, there are many hazards and safety risks associated with the field construction activities. By having your modular extruder system constructed offsite, potential hazards and production interruptions can be minimized. Single Source Responsibility – Is your project management organization stretched to the limit? By placing ONE purchase order for a pre-engineered and proven process module, there will be less of a burden on your project management team. Our engineers are involved daily in the development of solutions that provide world-class control for complex extrusion compounding systems and facilities. The flexible automation approach developed by ACS defines the current art of integrating diverse equipment and systems specified by the client into a highly productive system. The flexible extrusion control system can be based on a wide range of programmable controls and various HMI software products. Intelligent data collection & global Ethernet integration allows ACS clients to view & integrate extrusion systems efficiently into their business processes. Every extrusion control system requires thorough understanding of the total process. Apex Controls Specialists has nearly 30 years of experience in plastics compounding systems. It is essential to be skilled integrators of all phases of operations, from the raw material handling and feed streams to the disposition of the packaged product. ACS understands that the successful extrusion project requires far more than simply placing equipment on the factory floor. The successful extrusion project involves full consideration of all processes and is executed as a system that fits seamlessly into the client’s business. Apex Controls Specialists begins at the factory floor in building any new control system. These systems are designed with the Operator and the Maintenance teams in mind. It is important in each project to supply control systems that Operations can efficiently use and Maintenance has the proper and effective documentation to quickly resolve issues that may arise. Powerful, easy to use operator interface is a keystone to high operability. All systems should be controlled from one Human Machine Interface (HMI). The operator can quickly set up and visualize the process from a small number of common screens. Each component that makes up the system is presented on the screen in a process flow diagram. All auxiliary equipment, drives and feed systems communicate via high-speed network. This provides the operator with timely and precise feedback from the process. All programmable controls and software are field-proven for suitability in extrusion applications. 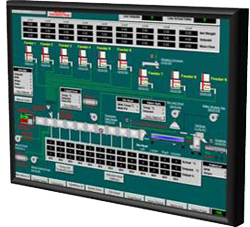 All HMI visualizations are designed with easy navigation in mind, with simple and accurate diagnostics. To assist in quality assurance, special production reports are provided and on-line SPC functionality. Apex Controls Specialists prides itself on being the “Best in Class” in extrusion controls. Many years of careful development have produced Operator and Maintenance friendly control systems for which ACS is recognized worldwide.